Black larder beetle species are common throughout the world. In fact, black larder beetles play an important role when it comes to recycling. Black larder beetles feed on most any dead animal. This includes animal hair and flesh. But this ferocious appetite can many times cause black larder beetles to forage into homes and other buildings where their feeding will be a problem. Black larder beetles are small and dark. Adults will be in the 5-10 mm range and will range from dark brown to black in color with a gray or light colored band around their thorax. They are strong flyers and naturally attracted to decaying flesh and rotting meat. Black larder beetles will regularly penetrate and nest in stored products like pet food or cheese. They love hanging meat like hams and sausage. And though adult black larder beetles are attracted to such food, they don’t eat nearly as much as their offspring. Adult black larder beetle females will seek a good food supply on which to lay eggs. If conditions are right, these eggs will hatch in as little as 2 days. Larva should be able to find food close by (since females lay eggs close to food) and will eat continuously till they are ready to pupate and become adults. They are ferocious eaters and can chew though most anything. This feeding may go on for 1-8 months depending on local temperatures, humidity and food quality. Once they get their full, larvae will move off the food source and find a safe location in which to pupate. This could be in a slight crack or crevice, behind some type of siding or on a tree. Larvae can chew into wood and have been known to cause lots of damage to structural members of homes and buildings during their trek to find safe harborage. Black larder beetle pupa will take a week or two to fully development before emerging as adults. This process could be delayed if it’s cold or other weather factors slow the process. When done, they will emerge as an energetic, light avoiding adult. Adults will mostly fly in darkness searching for fertile ground on which to continue their cycle. Males will be chasing females, which can start egg laying in as little as a week, and females are always seeking good food supplies on which to lay eggs. Female black larder beetles will lay hundreds – in some cases thousands – of eggs. If she planned accordingly, her young should have plenty to eat once they hatch. Black larder beetles are important to the natural cycle of animals. By consuming both flesh and carcass, black larder beetles enable dead animals to filter back into the earth. But this process can prove costly and expensive if they target something we’re trying to preserve. Black larder beetles will become a nuisance when they find their way into homes and other buildings. Barns, poultry houses, sheds, dog kennels and other areas where animals are kept seem to naturally attract black larder beetles. Though they prefer decomposing meat on which to feed, black larder beetles will take advantage of animal skins, leather, rugs, mattresses and clothing when food supplies are limited. They can live on hats, fabric and just about anything which uses animal parts such as hair or skin. Black larder beetles can be a hunters worse enemy since they love any animal that’s been mounted and displayed on the wall! For this reason they will target museums, taxidermists and butchers too. Cattle farms are another favorite location as are zoos and even animal shelters. Black larder beetles have been found on living animals too. Sickly dogs and other disease ridden wildlife can all become a target of this pest. Their small size and light body weight can make them difficult to notice. If left alone, they can cause huge amounts of damage and in extreme cases loss of life. 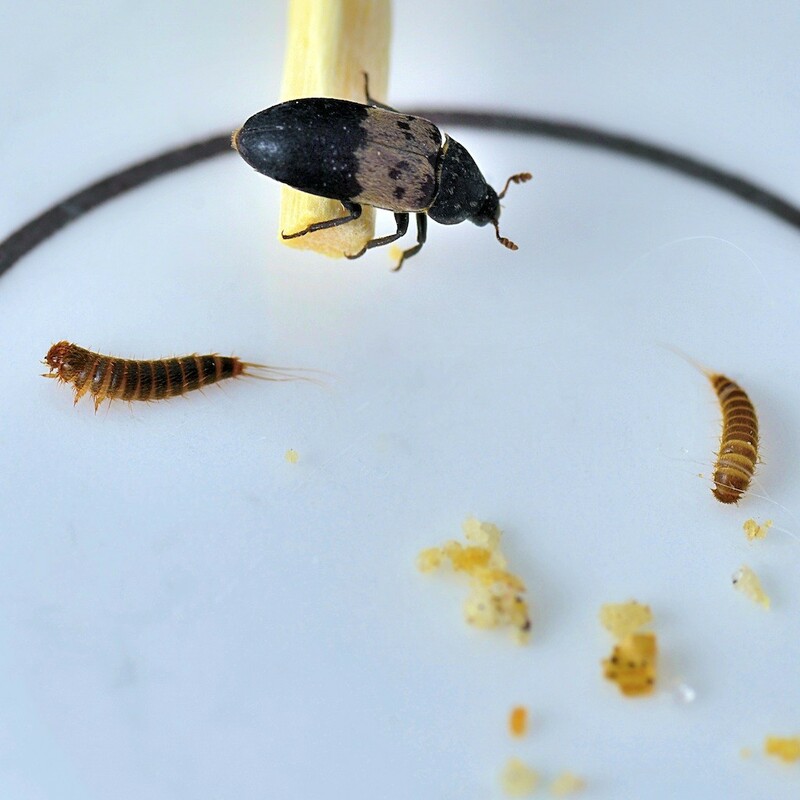 Treatment for black larder beetles is easy once you know where to treat. If you find something damaged, it’s important to inspect the entire room as well as other parts of the home to try and assess the extent of the infestation. Treatment options will depend on just how extensive the problem might be. With black larder beetles, it’s always better to treat more then what they’re eating. A good way to find out just how active they might be is to set out some BLACK LARDER BEETLE TRAPS. Set them in rooms where activity is suspected along with surrounding rooms to make sure you aren’t missing something. 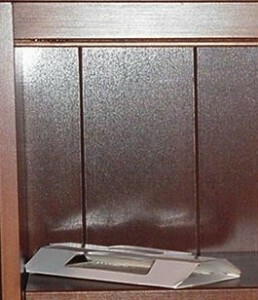 Treat any room where traps catch something. This extra work can prove to be a good “insurance policy” that will protect you from hatching eggs which could easily go unseen. For example, if you have a small place rug or animal skin which has activity, it’s best to assume larva have migrated away to other parts of the home. If you only treat the rug, you could allow other stages close by to continue the cycle and target non-treated areas. In other words, do yourself a favor and treat as large of an area as possible – especially if the traps are showing black larder beetles to be active somewhere you never expected. Treatment strategies should be determined based on how large the area or areas you need to spray. Small sheds won’t need a lot of product and can be adequately treated with PHANTOM AEROSOL. 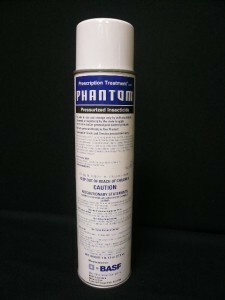 Commonly used for stored product pests, Phantom is easy to apply and gentle on most any surface. 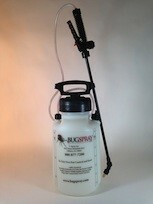 It uses a unique active which is “non repellent” to insects. They’ll readily walk over the chemical, pick up a lethal dose and before they die, transfer it to others. Phantom is slow working but this is by design. Exposed insects will take 3-4 days to finally die but before they will have shared the active with others so the net effect is much more than just the one exposed insect. This makes it an excellent choice to use on animal skins, fur, carpets, furniture, animal mounts and just about any surface black larder beetles might find attractive. Initially, use this product once every 2 weeks and then every 2-3 months to assure they don’t return or that you didn’t miss any stage. 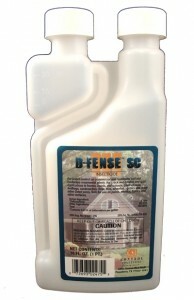 For large homes or commercial processing plants, it will be more efficient to use DFENSE SC concentrate. This product is odorless, mixes with water and will prove more economical in the long run. You can spray carpets, furniture and anything which can get wet. Use the Phantom for items you don’t want to spray with the liquid but for the bulk of the treatment, use the Dfense as much as possible. Mix it at the rate of .35 to .75 oz per gallon of water and retreat every 2 weeks when activity is noted; every 3 months for prevention. 1 gallon of mixed product will cover up to 1,000 sq/ft. For added protection, add the growth regulator NYLAR to the tank mix. Though Nylar won’t kill adult stages, it will prevent black larder beetle larvae from being able to grow into reproducing adults. It also lasts a long time with treatments lasting 6 months or more compared to just 1-2 months from the Dfense. The other benefit of Nylar is that it will “translocate”. Essentially this means it will relocate from where you spray it so the net coverage is much more than just the baseboards and furniture you spray. Use 1 oz of Nylar per gallon of water mixed with the Dfense and use the mixture over 1,000 sq/ft. Lastly, be sure to apply the Dfense and Nylar with a good PUMP SPRAYER. Ours comes with a range of fan pattern nozzles which will deliver the spray the right way for uniform coverage. Feeding larvae will spend their time in a limited area so they can easily be missed if treatments don’t cover everything when applied. Our sprayer will insure proper distribution over anything flat. Black larder beetle control can be done once you know where to treat and what they are targeting. Remember, they are excellent flyers and will many times find different areas of the home to occupy. Animal mounts, horse hair mattresses and just about any natural fabric or material in the home can become food for this ferocious insect. Phantom aerosol might be easy to use and handy but it may not be the most economical option. Get the concentrated Dfense and add Nylar for long term protection. Install some black larder beetle traps to get a better idea of just how bad the problem might be and be sure to change them out as needed. Once established, black larder beetles might take some time to get under control but it can be done.